1. Preheat oven to 425 degrees (F) with ten-inch cast iron skillet inside. Once the skillet and oven is preheated, move skillet to stovetop and set to medium heat. 2. 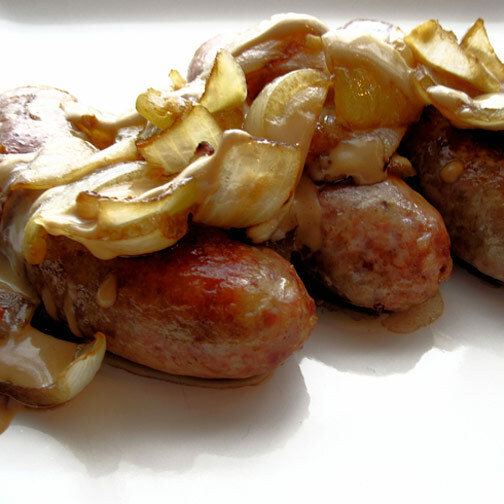 Add olive oil to skillet and place Premio Sausages into the skillet. Brown sausage, ensuring that all four sides are browned, by giving them a quarter turn every 3-4 minuets, being careful to get a good color but not to let them burn (use tongs and not a fork to turn the sausages so you don’t pierce the skins). 3. Once sausages are good and browned, take the skillet off the burner and pour the dark beer into the pan while it is still hot. 4. Add the onions and garlic to the top of the sausage, allowing them to sit on top of sausage. Let pan sit off of the burner for a minuet to rest (don’t let them cool). 5. Place the Iron skillet into the preheated oven and cook for 20 minutes or until the sausages reach an internal temperature of 165 degrees (F). 6. Remove sausages from oven and place onto a serving plate. Cover with foil to keep warm. 7. Return the skillet to medium heat. Whisk in the flour followed by the milk. Allow the Liquid to deglaze the bottom of the skillet. Bring sauce to a simmer for 5 minutes, then pour sauce over sausages and serve hot.